Are you Diehard fan of A.R Rahman’s music, then here is good news to you. A.R.Rahman is one of the best music directors in the world and he released his official mobile app recently. This is surely for his fans and followers can connect with him and his music easily through the app. 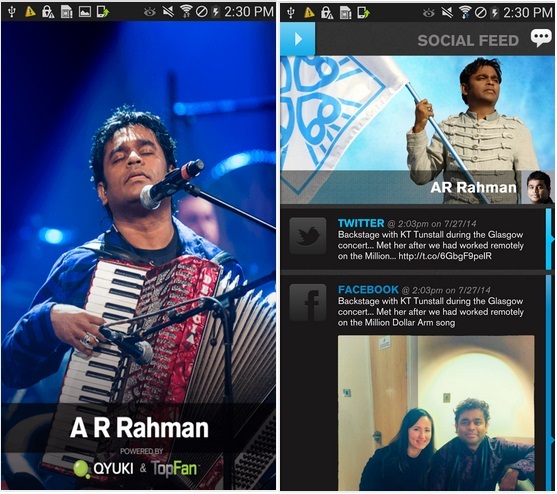 The app is named as “AR Rahman app” and it is available for Android and iOS users. There are over 24 million fans for his on Facebook and Twitter now and they will able to follow him through this AR Rahman app. The app is developed in partnership with an online multi-channel network Qyuki which is founded by A.R.Rahman and his friends. The Music King Rahman also gets in touch directly with his fans and followers with this app by providing exclusive content and merchandise. A.R.Rahman told in a statement to the news, “I wanted to thank my fans for their support by offering them a new and convenient way to stay in touch with me and my music. I am looking forward to a more engaging experience with my friends and well-wishers.” If you are always like his songs and music you can surely download this app and enjoy.